The twin-train derailments within minutes of each other that killed 25 people in Madhya Pradesh on August 5, 2015, is being blamed on flash floods. S Pushpavanam wonders if that is the only reason. At least 25 people died and 30 were missing when two express trains passing each other derailed while crossing a railway bridge struck by flash floods in Harda district of Madhya Pradesh in the dead of Tuesday night, sending 17 bogies and one engine tumbling into a rain-swollen river. 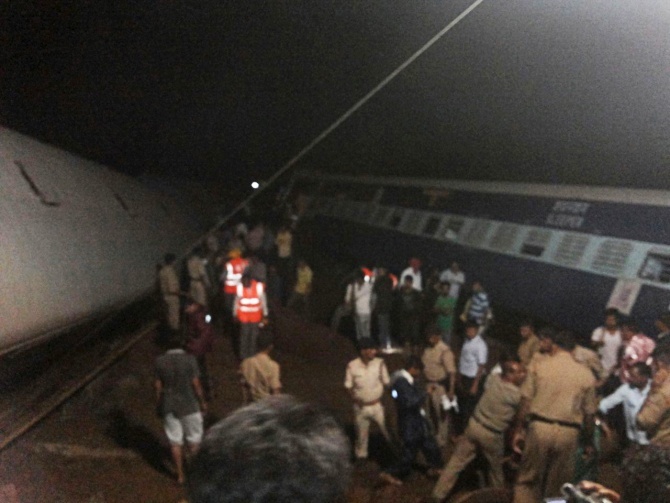 The twin derailment that occurred at around the same time, at about 11.30 pm, involved the Varanasi-bound Kamayani Express from Mumbai, which capsized first, and the Mumbai-bound Janata Express originating from Patna that was coming from the opposite direction. By 11 am the next day, they were still searching for trapped passengers. The commissioner for railway safety, attached to the civil aviation ministry to appear neutral but always manned by ex-railwaymen or deputationists, but before his inquiry could even begin the PRO came out with the theory that it was caused by 'flash floods', perhaps in an effort to guide him and he is their own man. The advantage of pitching for flash floods is that they are not only ‘capable’ of derailing heavy coaches but also of leaving no trace of their arrival and departure. No one can measure their volume or velocity. Flash floods could make the soil loose. It does not matter how two trains could have passed the same culvert a few minutes ago. There can also be no independent eyewitnesses at 11.30 pm. Accidents are always caused. Violation of rules invites accidents. One can see breath analysers kept in the originating station managers due to disuse. Bibek Debroy, who chaired a committee to restructure Indian Railways, suggested rigorous qualifying examinations to ensure competence and professionalism. Readers may not know how the railway bureaucracy promotes its workers. Master circular 37 says that in the SC/ST category, when no qualified worker is available, the best among the failed must be promoted. That means while in other categories a worker who gets 65 marks may not get promoted because there are people above him who have scored more, in this category among the workers who get 7,9,11 and 13 marks, the worker who gets 13 marks must be promoted. This does not exclude safety posts. The railway bureaucracy could do anything at will and on demand at the cost of safety. No railway head rolls, no matter how many coaches roll. The HR Khanna committee’s recommendation that DRMs, GMs and the chairman must take responsibility for accidents was immediately rejected by this self-serving RB to ensure its own safety. In the Peruman Train Tragedy, the Bangalore-Kanyakumari Experss derailed near Kollam and fell into a lake on July 8, 1988, killing 105 people. The meteorology department did not report even a strong wind. There was only a drizzle. But our RB closed the matter, spinning a theory that there was a tornado which toppled the train. The whole of India was shocked..
An intruder drove a train from Chennai Central till Arakkonam, killing four people on the way, on April 29, 2009. The driver is still at large and the investigation has been closed. The Parliamentary Standing Committee (SCR188) reports that 40 per cent the funds for safety was not utilised in 2013-14. These instances indicate the RB’s freedom from accountability. With heavy rains and floods occurring everywhere, flash floods were predictable. There are systems to prevent these accidents. Bridges and culverts have the highest flood level and the recent flood level marked on them. A historical study is available on spots prone to flash floods. Then there is the monsoon night patrol in force. The gangmen/trackmen (the personnel who check the tracks) of two neighbouring railway stations must walk on the tracks towards each other at not more than three kilometres/hour until they meet and exchange their notebooks. Station masters are supposed to inspect their work. If a gangman/trackman was found drunk or not available, the station masters must immediately send a caution signal to stations on either side. The driver’s acknowledgement is obtained. If something was found amiss, these gangman will have a signal to stop the oncoming trains. Besides, he has two clamp detonators (a device used to make a loud sound to alert the train driver) half a kilometre away either way. Once the train hits the detonator, no driver can miss the sound. As a last resort, the train driver has equipment called the fusse (a sort of flare). If it is lit, it will burn for 20-30 minutes even in heavy rain. If a train derails in double track, the duty of the derailed train driver is to switch on the flasher light to warn the other train. A guard’s duty is first to protect the train on the other track. With walkie-talkies, instant alerts could be given. This system, unfortunately, is not being followed. So, you have a recipe for disaster. S Pushpavanam is secretary, Consumer Protection Council, Tamil Nadu.